It was all gloomy weather as I drove back home from office and all I craved throughout my drive was for some chatpata snacks. So as soon as I reached home browsed through the ingredients to find boiled potatoes, pav, chopped onions, roasted peanuts, pomegranate and aloo sev. With these ingredients all I could think of was making some Dabeli and enjoy the rainy splendor outside along with chai. 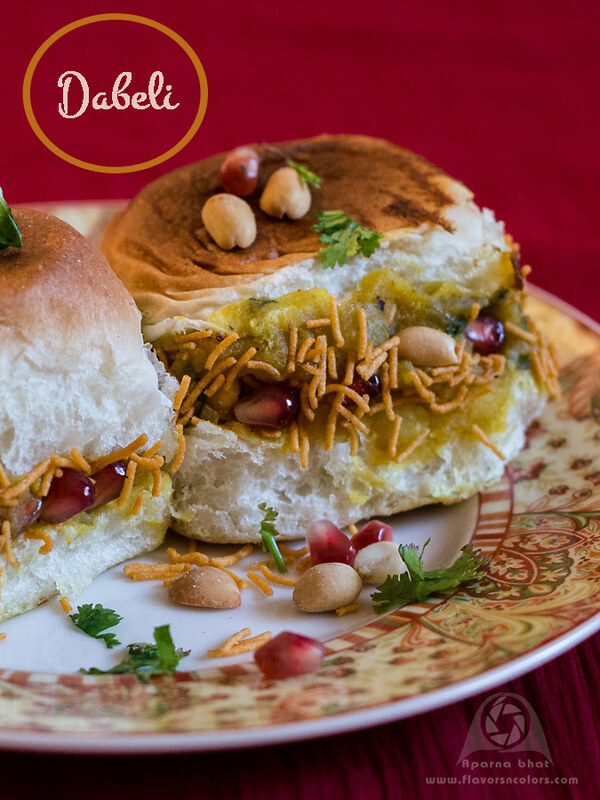 Kutchi Dabeli or Double Roti is popular street side snack food from a place called Kutch in Gujarat where they use this special Dabeli masala. Since I was out of stock with this special masala I decided to substitute it with mix of pav bhaji masala, garam masala and chaat masala. Let's see how to prepare this snack without Dabeli masala powder. Heat butter +oil in pan. Add chopped onions and saute till translucent. Now lower the flame and add all the dry spice powders. Saute it for a minute. Now add finely chopped coriander leaves, mashed potatoes, tamarind extract, jaggery, salt to taste. Mix it well. Add water as required. Let the mixture come to a boil and cook it till the consistency of the mixture becomes thick. Switch off the flame. Add pomegranate seeds and roasted peanuts and mix it well. Allow it to cool. Remove the mixture from pan to a bowl. Now slice the pav into halves without cutting through. Apply sweet chutney on the inside of the pav and place 2 -3 tbsp of filling. Sprinkle some pomegranate seeds, roasted peanuts, sev and cover it with other half of the pav. Heat the pan that was used to make potato mixture and roast the pav [with filling] on both sides with some butter. Roll it into sev, toasted peanuts, pomegranates. You can garnish these pav with coriander leaves, peanuts and pomegranate seeds. Serve hot with chai and enjoy! This is my favorite, yummy.